As the temperatures drop, many of us are looking for ways to keep warm — and that includes the wild animals living in the beautiful expanses of the Swiss Alps. Nestled in the picturesque mountain range is a special place, Arosa Bärenland, a sanctuary run by Four Paws International, and a hidden camera there caught one of these wild animals searching for a cozy place to curl up. An apparently curious wild fox can be seen perusing a little structure built there for the sanctuary's resident: a rescued bear named Napa. Footage shows the sly little visitor sniffing around Napa's den. At first he seems curious about going through the curved entrance — then he seems to think better of the idea. Maybe he realized the den was already occupied by an animal much larger than him. (But perhaps Napa would have accommodated him, if given the chance. 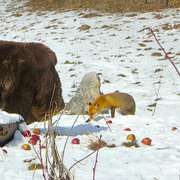 At another Four Paws sanctuary, staff have witnessed rescued bears sharing snacks with a wild fox). In any case, the fox went on his way, leaving the sanctuary's resident to sleep peacefully. "The sanctuary has some small passageways for little animals, and that`s how the fox got inside," Jeta Lepaja, storyteller for Four Paws' sanctuaries, told The Dodo. The fox is the first wild animal to visit Napa so far, as Napa hasn't been at this beautiful sanctuary for very long. In fact, earlier this year, Napa had no idea he'd ever have such a fortunate life. The 20-year-old bear had spent his whole life going from one cage to another. 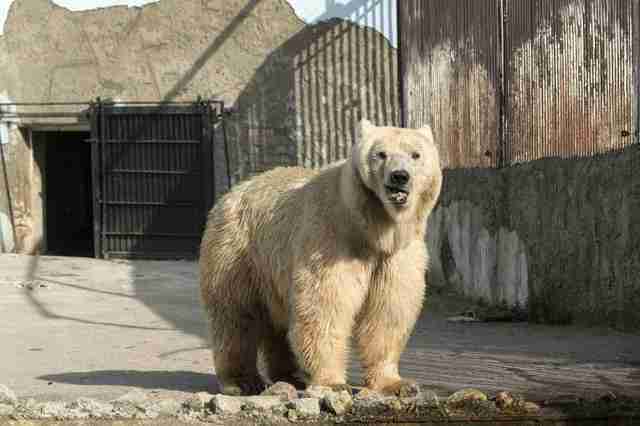 Since being retired from the circus in Serbia in 2009, Napa lived for the last several years in a concrete enclosure at a zoo in Serbia. Four Paws organized Napa's transfer to Arosa Bärenland this past summer. Since then, the captive bear has gotten to live a life he probably never even dreamed of — he has gotten to follow his natural instincts and feel the grass beneath his paws. 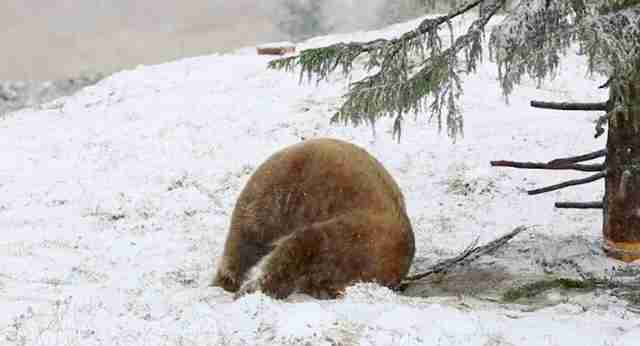 Many captive bears are so disoriented that they never have a chance to hibernate, even after being rescued. Just a few weeks ago, no one was sure how Napa would react to the winter. When the first snow came, it was clear that he loved every moment out in the swirling flakes. And rescuers hoped this would also signal to him that it was time to hibernate. "It might take a year for him to get used to his new environment," Lepaja said at the time. 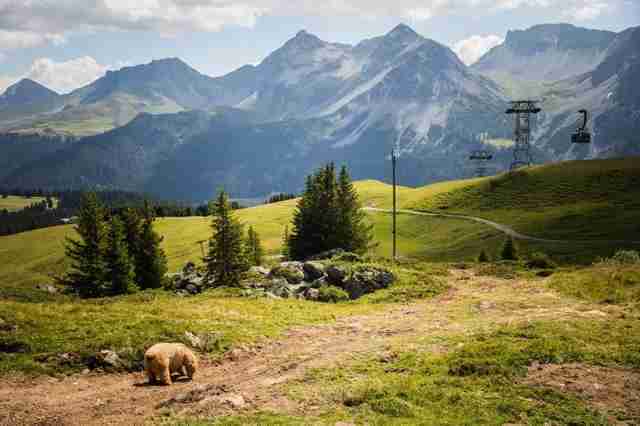 "But as in Arosa winter will be cold and snowy, he might actually go through [the] process." But now that winter has really set in, Napa seems to be very interested in staying in the cozy den he helped to make comfortable with a lot of warm hay. 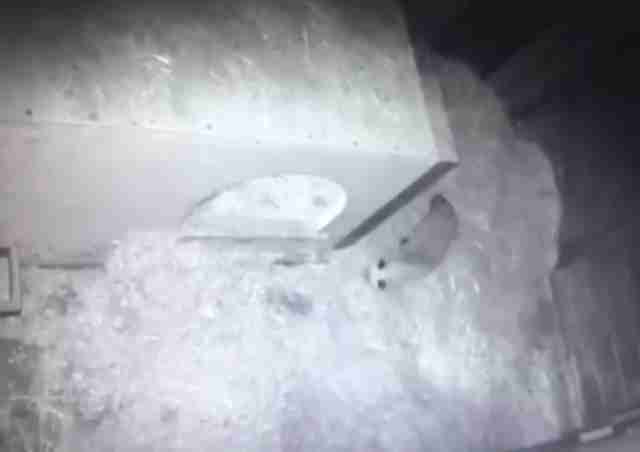 "Napa is sleeping continuously in this little wooden box," Lepaja said this week. This formerly caged circus bear has shown just how perfectly he can be exactly what he was meant to be all along — just a regular bear. You can give Napa a little gift this winter by making a donation to Four Paws International.